Spinal stenosis from a herniated disc is one of the most common forms of transitional stenosis which may affect the central canal, as well as the lateral recess and the foraminal spaces. Herniated and bulging discs are incredibly typical spinal abnormalities which have long been vilified in the back and neck treatment sector, even though most are not the source of any pain or neurological symptoms whatsoever. However, when circumstances are ideal, herniated discs can indeed cause spinal stenosis and can also cause foraminal stenosis in unfortunate patients, based on purely structural changes in the spinal anatomy. In most others, symptoms blamed on coincidental herniations may turn out to be misdiagnosed. This narrative centers on the relationship between intervertebral herniation and the formation of spinal stenosis changes in the central and foraminal canals. Herniations occur when the intervertebral disc structure bulges and possibly ruptures from its normal shape and size. Herniations come in a great diversity of styles, ranging from completely innocent and asymptomatic to dire surgical emergencies. Most luckily tend towards the former conservative designation. When a herniation swells into the spinal canal, many consequences can result. If a large herniation is central or posterolateral, the central canal can suffer stenosis on the anterior face. This can also cause lateral recess stenosis in some patients. When the herniation is posterolateral, foraminal or far lateral, the neuroforaminal opening can be decreased in size. Learn how to best treat a herniated disc and research your diagnosed type of intervertebral disc pathology on Herniated-Disc-Pain.Org. 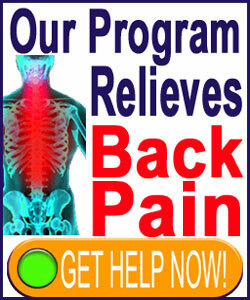 The vast majority of all herniations do not affect nerve structures and are therefore harmless. Remember, a bulging disc does not feel any pain unto itself, since discs have no internal nerve endings. Many central and paramedial herniations might efface or indent the thecal sac, but this is almost always a nonissue. It is not until actual spinal cord compression occurs that these herniations become symptomatic in most patients. Likewise, many herniations will impinge on the foraminal space, but still allow plenty of room for the nerve to exit the space without compression. If the neuroforaminal stenosis becomes very severe, then an actual pinched nerve may result. Herniated discs have the unpleasant distinction of being the most popular of all stenosis back pain scapegoats. The very words herniated disc bring fear to mind in anyone with a history of chronic pain, which is a shame, based on their factual lack of correlation to most painful complaints which have been mistakenly blamed upon them. 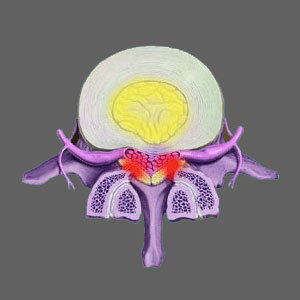 For cases of true symptomatic spinal stenosis caused by herniated discs, there are usually other contributory factors, such as ligamentum flavum hypertrophy or a congenitally narrowed spinal canal. In these scenarios, treatment may be indicated and in extreme cases, spinal stenosis surgery may even be required.